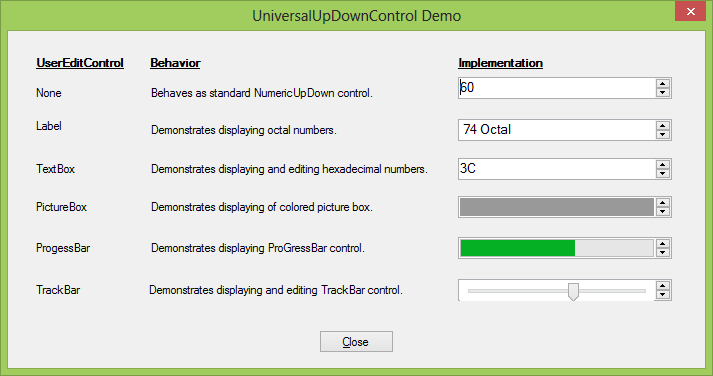 If you develop applications for Windows, you surely came across NumericUpDown control. It is handy in many scenarios, but also somehow limited. As usual I started with Google search. I found several articles talking about how to improve it, but none of them were sufficient for my needs. I decided to go into a somewhat different direction. Why instead of enhancing existing elements of NumericUpDown control, provide ability to replace edit element of it with any (editable or not) control? This would open an entire new world to how this control could be used. With flexibility to provide your own editing component to NumericUpDown, you can show numbers using formatting of your choice or you can display your own graphical controls, elements, images. There are really no limits to what can go there. Of course, it's not NumericUpDown anymore. I had to drop 'Numeric' prefix, and decided to call it UniversalUpDown control. NumericUpDown control is a composite control. When you look at it, you see two distinct areas. TextBox like area where numbers are displayed and edited, and squared UpDown buttons. And that is how NumericUpDown is composed. It has two internal controls: UpDownEdit and UpDownButtons. Knowing how NumericUpdown is structured, our task is easy. Provide public property (I named it UserEditControl) where user can provide as a parameter any control that will replace UpDownEdit. Of course, the control defined as above doesn't do anything more than standard NumericUpDown. We need to write missing code. First goes constructor. Besides what every constructor does, it has to do a little housekeeping: find reference to UpDownEdit element of control and save it in local variable. It will be handy in UserEditControl property setter where we will be replacing it with user provided control. I decided to use loop instead because this appeared to me a safer approach to be 100% sure that value stored in m_UpDownEdit is truly UpDownEdit instance not UpdownButtons. The next task is to complete coding of UserEditControl property. Please read comments inside the code section below. I hope they explain everything. //Now we have to add new UserEditControl. Simplicity comes at a little extra cost. Since you are providing your own edit control, you need to intercept ValueChaged event in order to change appearance of UserEditControl. If UserEditControl is editable, you also have to provide the means to set control's value property after value of UserEditControl change. //with values between 0 and 255. //As UserEditControl we will be using TextBox control. //value of UniversalUpDown when editing is done. The attached code contains the source code of the control discussed in this tip and demo program shows few examples of UniversalUpDown in action.